This week marked 10 years since Steve Jobs unveiled the original iPhone at Macworld in San Francisco. 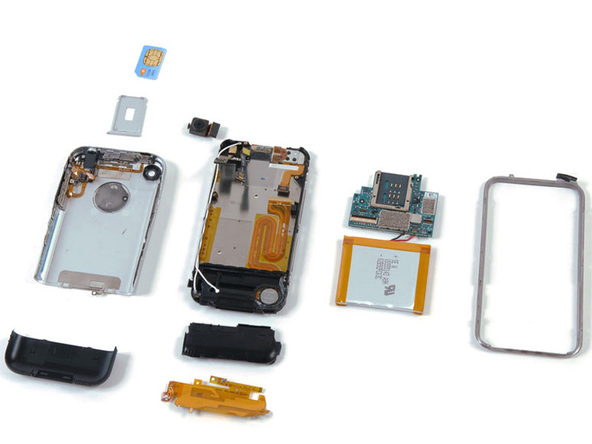 In commemoration, iFixit has published a roundup of 15 iPhone teardowns the site has completed over the past decade, offering a look at how the design's construction has evolved over time. In contrast to Apple's iMacs and MacBooks which have become progressively more difficult to repair in recent years, the iPhone's repairability score has fared a lot better after quickly improving upon its first incarnation, as noted by iFixit. iPhones have become taller, wider, and skinnier. But they’ve also become more repairable. The very first iPhone earned a dismal 2/10 on our repairability scale. It had a soldered battery and was almost impossible to open without breaking the case. Repairability improved radically from there — jumping to a 7/10 for the iPhone 3G. Since then, the company's flagship smartphone has remained relatively repair-friendly, earning at least 6/10 on iFixit's repairability rating with every iteration. The most recent iPhone offering, the iPhone 7, was awarded 7/10 on the scale in 2016. Check out the "10 Years of iPhone" roundup page on iFixit, which also features a neat look at the visual changes the components have undergone over 15 models. Samsung looks back on 10 years of copying from Apple! I think some of these devices (Macs/iPhones) created by Apple are becoming more problematic to repair with all the adhesive they use now with batteries and other components. I know the larger 12.9 inch iPad Pro uses alot of adhesive and I believe the 7+ also uses adhesive as well. It just makes it more difficult for the user to make the repair, unless it sent to Apple. Interesting read to see where the repairability score was when the 2G launched compared to the iPhone 7. Extra adhesive is for water resistance, yeah? To be fair to Samsung, they are only looking back on 9 and a half years of copying right now!